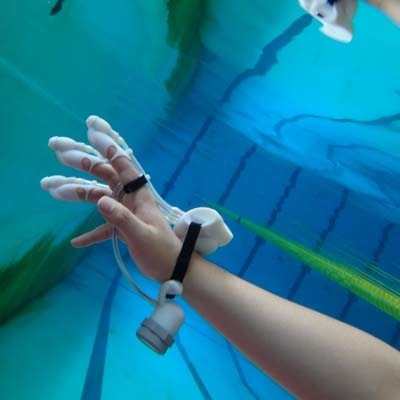 IrukaTact is an open source underwater glove that translates ultrasonic range-finding data into haptic feedback. Inspired by dolphin (iruka in Japanese) echolocation, this system detects underwater topographies, assisting in the location of sunken objects in flooded areas. Micro-pumps on the glove send haptic signals to the wearer's fingertips by propelling water of varying pressures. Our feedback method extends current haptic technologies by providing hybrid actuation, including pressure and vibration underwater, while preserving the wearer's natural ability to grasp objects. IrukaTact has many potential applications beyond underwater echo-haptic location, such as in new interfaces for virtual object simulation in aqueous environments. Chacin, A.C., Oozu, T., and Iwata, H. IrukaTact: Submersible haptic search glove. Proc. of the 10th International Conference on Tangible, Embedded, and Embodied Interaction. ACM, New York, 2016, 392–397. An underwater glove with haptic feedback inspired by dolphin echolocation.